How independent letting agents can attract and convert new landlords by using creative and innovative marketing tactics. It’s true that there are many clever and technologically-advanced methods to find landlords and track them down. Once you know where they live, you can bombard them with your literature, sure, but is that really the best way to begin what could be a long and fruitful working relationship with them? Who is your typical landlord? 3. What kind of house do they live in? 5. What do they like doing in their spare time? 6. What do they drive? Let me have a go. The landlord I have in my mind is called Robert, he’s a 55 year old solicitor who lives in a four bedroom detached house, and likes to golf in his spare time. He drives a quality car, probably German; maybe BMW or Mercedes. Perhaps you recognise him? In fact, if you compared the chances of say, a 25 year old hairdresser being a BTL landlord with our Robert, he would probably be about 1000 times more likely to be a landlord than the hairdresser. Once you know who these landlords are the most likely to be, then you’ll find that they aren’t invisible, after all. In fact, they are highly visible. If you want to find professionals, just look on Yell.com or even just Google, and you’ll find them. Now all you have to do is figure out how to attract them. What type of landlord do you want? Let’s segment the landlord market into three categories – I like to call these Ambitious Newbie, Accidental and Pro. That leaves the Ambitious Newbie. This is the guy that’s watched Homes Under the Hammer and decides to go pro. Just the small problems of the lack of funds, no financing agreement and little time (he works full time) are holding him back. Despite these challenges, he’s super ambitious and determined to make it work, and best of all, he needs you. He’ll listen to what you say, take your advice, and won’t usually haggle on fee. If you can take him from zero to three properties in the first year or so, he’ll stay loyal forever; eventually becoming the Pro we talked about earlier, and (hopefully) impossible for anyone else to poach. 4. ValPal – (or other instant online valuation tool) – this is giving some of my clients all their leads at the moment. But you have to be really tactical with it. The way you drive traffic to the page, how you make sure as many people as possible complete the form, how you re-market to the ones that don’t, and then how you follow up with the submissions, – all these elements make the difference between success and failure of the tool. 5. Join my free online training session! On Monday 19th December I’ll be sharing My 5 Step Formula to Attracting New Landlords in a free online training session. Just for independent letting agents, you’ll discover how to build huge trust/credibility through multiple online marketing streams, how to create highly engaging content that attracts your ideal landlords, and the special offline strategy that hardly anybody uses yet has the most powerful impact in your marketplace. We live in very exciting times, but sometimes the choice of marketing options feels overwhelming. To help you, I’m running a free online training session on Monday 19th December at 2pm. Just click here to save your seat completely free. 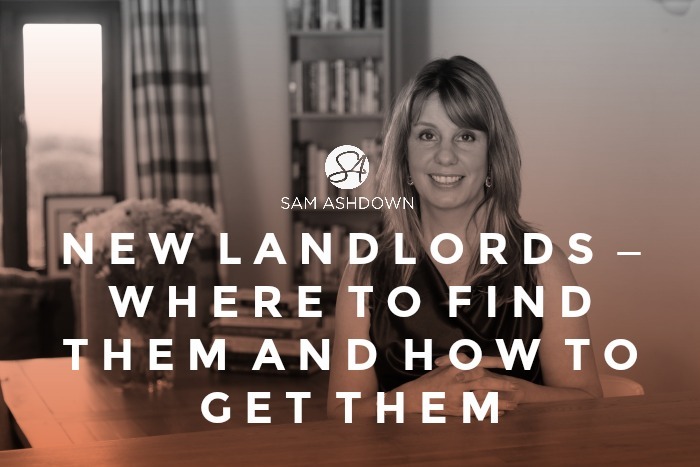 I’ll spend an hour showing you how to create your very own landlord attraction strategy, and how to implement a clear, simple action plan to boost your lettings business and set you apart from the competition.